Fast food restaurants are typically not the first thing that comes to mind when you think of environmental consciousness, but now Wendy’s is seeking to change that: The burger chain announced that it’s going to reduce the number of napkins it stuffs into drive-thru bags from 20-something napkins to a more eco-friendly 15-ish napkins. Awesome. Way to make that napkin wad a little smaller for the good of the planet, Wendy’s! To ensure customers aren’t too thrown off by the change, Wendy’s made sure to note that its napkins will still be crushed against your box of fries and soaked with grease, but that between all 12 to 18 napkins, you could probably find a few clean inches of paper to wipe mayo off your face. 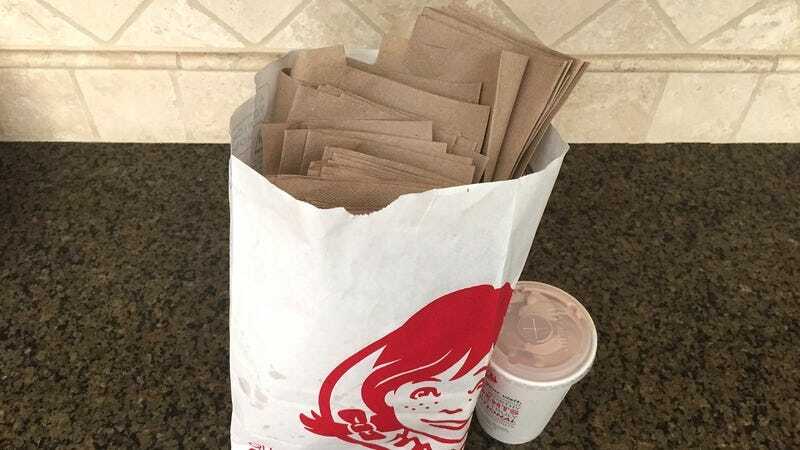 Bravo, Wendy’s, for making the change to just give out an absurd number of napkins instead of an ungodly amount of napkins! This is a serious win for Mother Earth.